WE WORK ON ALL SHAPES AND SIZES AND COLORS TOO! Elmer's Brighton Garage Offers Auto Repair Services You Can Count On! 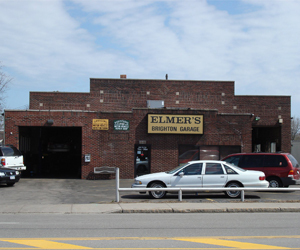 Elmer's Brighton Garage has been providing customers in the Rochester, NY 14618 area with high-quality automotive maintenance and repair services since 1932. Our experienced mechanics will get your vehicle up and running again, and we'll keep it in top operating condition. We provide a range of services, including 4x4 Services, Brakes, Car & Truck Care, Domestic Cars & Trucks, Electrical Services, Electronic Services, Engine & Transmission, Engine Maintenance, General Services, Heating and Cooling Services, Import Cars & Trucks, Inspections and Emissions, Miscellaneous Services, Quick Lube Services, Tires, Towing, Towing & Recovery, Transmission Services and Undercar Services. We're proud of our great mechanics, who have years of experience working on many different types of vehicles. They have the knowledge required to diagnose your problems, and to find affordable solutions to get you back on the road quickly. To learn more about our services, call us at 585-244-1616 or email us today. We're looking forward to earning your trust as a friendly, honest and reliable alternative for your auto maintenance and repair needs in Rochester. Exceptional service! Took my vehicle in for service. I needed to leave the car for the day. Owner made sure I had a vehicle to use to get to work. He went above and beyond! In today's day and age you don't see that type of personal service much anymore, KUDOS to Elmer's Garage. Highly recommend. Price was in line with what he told me, explained everything to me that was done. I'm not from the area however my wheel well fell off so I stopped to see if they could help. The owner was very kind and helped me right away. I will go back if I need to and recommend them highly! Thank you! One of the best garages I've ever been to. Very friendly staff. Brought my car in without an appointment, got an oil change, inspection, and 2 new tires and was out of there within 3 hours. Nothing but good things to say about this place based on my visit. John and crew are the best to deal with. Very fair and honest. I would never consider taking my vehicles anywhere else. Great service, experienced mechanics, the wish I'd been taking my car here sooner. I won't bring it anywhere else from now on. Great service! They could have upsold me but chose not to. I will be back! Nothing but great things to say about these guys. Extremely polite and friendly service. I've yet to have any issues with the work they've done. They'll go into detail over what the problem is and how to fix it to help you make a decision. They're what I've been looking for in a shop. I called and was able to get an appointment within a couple of hours, the service was very fast and friendly. I would definitely recommend this garage for any kind of work you need done to your car in the Rochester area! My parent's have used Elmer's for more than 30 years and I have been going there for 15 years. Always great service, honest people and high quality work. John and the rest of the crew are fantastic. I was in town for a few days when my change oil light lit up. I purchased the synthetic oil at a local auto parts store and then drove next door to Elmer's Garage to see if they could perform the labor. Couldn't have asked for a more friendly, helpful or fair treatment. John, the owner, fairly discounted the cost given that I had already purchased the oil and heard him advise subsequent clients against unnecessary repairs or interventions to their cars even though he could have benefited from the income. Friendly, prompt, trustworthy. I had frequented other garages in Rochester when I lived there. This is the garage to go to. The best Garage in Rochester without a doubt. Helped me on numerous occasions with looking at cars before I purchased them, were extremely patient and helped me look for exactly what I wanted. Have gone to them for repairs and questions and have always left feeling satisfied. Great staff, always very friendly and will do whatever they can to help. I've never met a person who was dissatisfied with their experience at Elmer's. That is the only place I will ever go for repairs and service, they are head and shoulders above the rest. They live up to and exceed expectations, overall GREAT service.